Pawn your Richard Mille Watch | We offer Loans on Richard Mille Watches! If you’re thinking “how do I pawn my Richard Mille watch in London?”, New Bond Street Pawnbrokers are here to help. Richard Mille is a Swiss luxury watch brand founded in the late ’90s. Its most esteemed models include the Sapphire Split Seconds RM 056 – the very first watch with a case built from sapphire – and the Tourbillon RM 008. 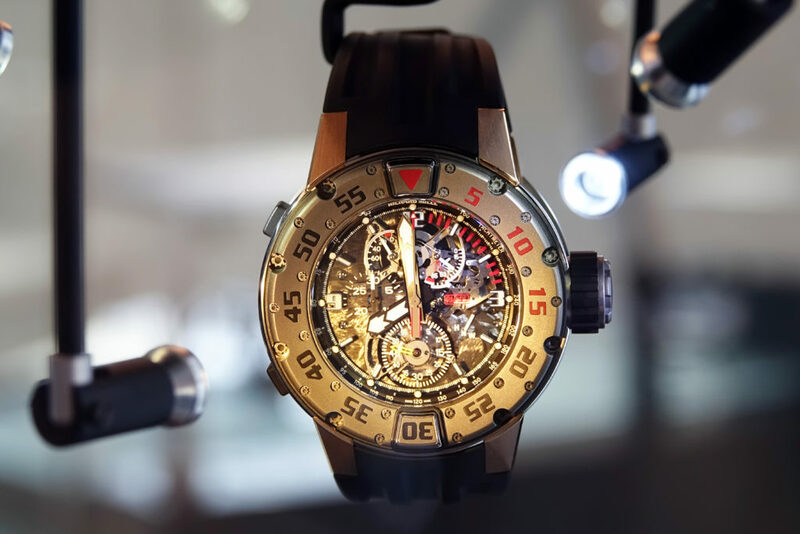 The brand sponsors several notable sportsmen, including tennis player Rafael Nadal, Formula One driver Jenson Button and sprinter Yohan Blake, who wore a Richard Mille watch sporting the national colours of Jamaica during the 2012 Olympic Games. How much is my Richard Mille watch worth? Some watches have a tendency to depreciate in value once they’ve left the showroom, although most Richard Mille models are held in such high regard that they tend to retain their value. At auction, the Richard Mille Tourbillon RM003 model can fetch upward of £100,000. Rare models, such as the Tourbillon Rafael Nadal, can command a price tag of over £492,000. The mechanical and aesthetic condition of your Richard Mille watch will largely dictate what it is worth. It’s easier to secure great value loans on Richard Mille watches that are in perfect condition, although if your watch has some minor issues that can be repaired, this shouldn’t affect its value too much. Is your Richard Mille watch authentic? Provenance can help increase the value of your Richard Mille timepiece. If you’re wondering what to bring when you go to pawn your Richard Mille watch, you should be aware that it’s good practice to bring certificates of authenticity, repair documentation and proof of purchase. These documents could even increase the value of your watch. How old is your Richard Mille luxury watch? While Richard Mille watches have only been on the market since 1999, that doesn’t mean they can’t command large values at auction. Richard Mille sponsors a lot of sportspersons, so if your timepiece has been previously worn or signed by a notable athlete, this could increase its value. Limited edition items like the RM056 could also fetch large amounts at auction, based on their rarity. Richard Mille watches are generally regarded as heirlooms to be enjoyed for an entire lifetime. Despite this, you might find yourself in a situation where you need fast access to funds – to finance another investment or to cover unexpected costs, for example. If you’re in need of a cash loan, pawning your Richard Mille luxury watch couldn’t be easier. Your timepiece will be kept secure and will be released to you take home after you have made your final loan repayment.